Herbie befriends a thieving street urchin in Mexico and gets his new owners in trouble when he smuggles the boy aboard a cruise ship and breaks loose in the cargo hold. Some treasure hunters searching for hidden Inca gold must recover stolen film that the boy accidentally transferred from one stolen wallet to another. I like the car’s tricks, and his friendship with the orphan is suitably heartwarming, but the other characters and plot are nothing special. Moreover, poor Herbie keeps getting more and more decrepit-looking throughout the movie. They patch him up at the end, but we never get to see him race! Nearly ruining his driver’s chance to qualify for the Trans-France Race, Herbie falls in love with another race car in Paris, one driven by a woman who resents discrimination against female racers. Meanwhile, Herbie is being chased by two bumbling diamond thieves, who have hidden a fist-sized gem in Herbie’s gas tank. In this sequel to The Love Bug, the characters are totally different, except the car himself. The settings overlap, though: Herbie’s owner, a delightful little old lady played by Helen Hays (who I recognize from the Disney movie Candleshoe), still lives in the same house in San Francisco. In part because the connection to racing is lost, in part because the real-estate developer is so explicitly Machiavellian, and in part because the lead male is pretty dopey, I liked this movie less than the original. That’s normal for sequels, though, and it was still cute. The best part of Dead Men Tell No Tales was the hilarious dry-land bank robbery scene. The runner-up was the failed-execution scene, which was also, notably, a scene on dry land. The CGI was impressive and all, but the ocean consists of entirely too much water, albeit fake water, if you ask me. Clearly I need to read more Australian books. The vocabulary in I’ll Tell You Mine felt quite alien. I’d say everything (apart from “daggy”) is pretty clear from context, or from conversations I’ve had with Australians and New Zealanders I’ve met in Singapore. Still, I had no idea until I looked it up why a truck would be called a “ute”. (It’s a strange word, one that would sound like Vinny in My Cousin Vinny saying “youth”.) The first time I saw “ute” on the page, it looked like a typo that was meant to be a longer word, or an acronym that was meant to be put in all caps, or at least a brand name that was meant to start with a capital letter. But no, “ute” is a word that’s short for “utility”. Apparently it refers to something that might be a pick-up truck or something like a cross between a normal car and a pick-up truck. Such vehicles are said to have “trays”. Learn something new every day. 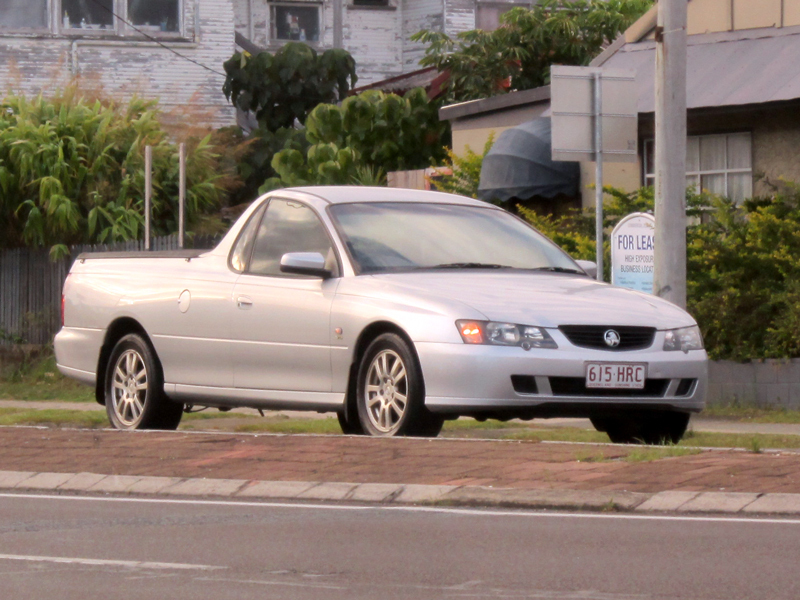 Update: I have now been to Australia and seen a ute. Behold! That is NOT a pickup truck. Also, it is NOT a car. I love the word “dodgy”, but I dislike all the Ozzie diminutives. I’ve pretty much stopped saying “vacations” since no one around me says it, and as I’ve mentioned, it’s getting harder for me to call a place where you buy something a “store”. I’ve left out (or “missed out”) words relating to school stuff (Year Elevens), place names (Wagga Wagga), and sports (netball). These days I don’t even notice most British spellings (organisation, centimetre, flavour), though “gaol” is still pretty strange. I wish I’d kept a list of interesting words and expressions as I was reading the book. The list would be twice as long! This Australian author is in my YA writing group. Why does a hamburger symbolize food? I don’t know what the English text of this blurry “no food or drink” sign says, but I don’t care; I’ve covered the text aspect of these signs already. I took the photo because I wanted to talk about the food and drink symbols. The bigger sign features a double burger; usually the burgers on these signs only have one layer between two buns. The smaller sign features a stemmed glass with a bent straw, suggesting an alcoholic cocktail; usually the drinks on these signs are trapezoids with straight straws that suggest sugary, carbonated soft drinks. Both of the stickers, thus, differ in interesting ways from the canonical or prototypical “no food or drink” sign. Still, I wonder how the prototypical “no food or drink” sign came about! I’ve seen similar signs all over the world, in places where a hamburger (or for that matter, the fast food restaurant in general) is presumably not a domestic cultural touchstone, but a relatively recent foreign import. These stickers are not what you think of when someone says “globalization”, are they? Yet their spread must be attributable to the increase in international trade and communication in the decades since the hamburger was invented. I’d say the second one is more likely to explain why, all over the world, those black/red/white signs depict “food” as a hamburger. When I was little, I loved movies where stuff moved by itself. I loved animate inanimate objects like Herbie the VW Beetle, talking animals like the cat in The Cat from Outer Space, and people who could do telekinesis, like the siblings in Escape to Witch Mountain. These days I enjoy racing car movies, like the Fast and Furious series, Speed Racer, and even Death Race, despite how bloody it is. The Love Bug is a family comedy that features a racing car that moves by itself. What’s not to love? I watched it with the audio commentary on this time, so rather than hearing the film’s dialog, I was hearing comments from the three main actors years after the filming. One thing the commentators pointed out was the matte backgrounds. I tend to think of fake sets as being CGI and very artificial, but movies have been artificial a lot longer than computers have been around. The methods we use to trick the eyes have changed, but the effect is the same. A backdrop created with pixels isn’t necessarily more beautiful or realistic than a backdrop created with paint. The actor who was describing scenes set in foggy San Francisco couldn’t remember, and couldn’t reliably discern, which scenes were filmed on location and which locations had been painted in. The movie is more impressive if you think about how many of the simple-looking special effects had to be done in real life with physical tools and props, such as the scene on the DVD cover where the car is bouncing across the surface of a pond. They had a plastic car on wires attached to poles on either side of the pond, and they bounced the car on the water. It’s much simpler, and much more complicated, than it looks! Memorable moments in the movie: Herbie getting drunk on Irish coffee with whipped cream, which I don’t think I understood very well when I was a kid; a phone in a car, which must have been devilishly expensive at the time; diverted race cars zooming through a mine, and then Herbie getting in an elevator sideways to exit the mine at the top of a hill. The space between “every” and “day” is missing. Yes. Yes, it is, but it’s an adjective, and what’s needed in this and similar contexts is the two-word adverb phrase. These are my everyday shoes. I wear them every day. Now, can anyone tell me why there’s no such word as “everywhen”? We have “everywhere”, and “everything”, not to mention those vaguely plural singular words “everyone” and “everybody”. This season was all over the place. For like the first third of the episodes, there’s a guy (Ghost Rider) who’s possessed by some kind of devil. What happened to science? The show is usually focused on superhero powers deriving from inhuman DNA being acted on by some kind of material transforming agent. Being possessed by a being from another dimension for no particular reason doesn’t fit very well with the science that gives everyone else weird powers. Also, how is it that his car can burst into flames and not burn? Did the car make a deal with the devil, too? Whatever. Then Ghost Rider pretty much disappears, and we’ve got an android (AIDA) who has some powerful AI and also an evil magic book that looks like a Buffy the Vampire Slayer prop. Is the android the primary antagonist in the season, or is the primary antagonist the man who created her? There’s a lot of back and forth on that issue; I won’t give away the ending. There’s a digital world called The Framework that’s suspiciously like the one in a certain movie I keep comparing everything to. It was created (with the help of the ridiculous-looking evil magic book) for a specific set of individuals to live in. In The Framework, one major regret was erased from each of those individuals’ lives. I object to the use of the word ‘regret’ in this context because the thing that changed wasn’t something that the individual was responsible for; it was just something that the person wished had been different. That confused me for a while. It’s great that the characters care about each other, face tough choices, and overcome tough problems, but I enjoy the show mainly because the writing sparkles with humor. Some sci-fi (*cough cough* The 100) is just too serious.